Tackling gender inequality in higher education institutions implies specific challenges for the politics of feminist knowledge transfer. Such institutions tend to reproduce gender inequalities in their own structures and functioning as well as in the process of knowledge production. For this reason, both aspects are addressed by gender mainstreaming, as has been the case as part of the EU-funded structural change projects undertaken under the FP7 and Horizon 2020 framework programmes. Higher education has been a key area of concern for the EU’s gender mainstreaming strategy. Gender mainstreaming, moreover, has been promoted at the impetus of the European Union (EU) (see, e.g., the Roadmap for Equality between women and men, 2006–2010; and the Strategy for Equality between women and men, 2010–2015). 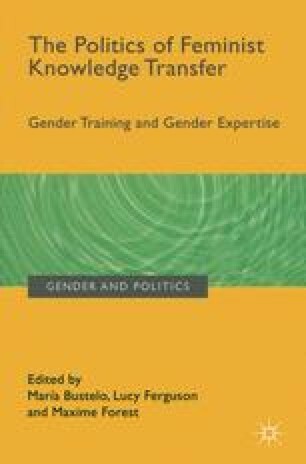 Teresa Rees defines gender mainstreaming as “the promotion of gender equality through its systematic integration into all systems and structures, into all policies, processes, and procedures, into the organization and its culture, into ways if seeing and doing” (Rees, 2005). Its implementation requires the work of “gender mainstreaming advocates” (Hafner-Burton and Pollack, 2000, p. 440) struggling to ensure that their own institution leads on gender equality policies.